Tall Ships Festival 2017 … the boys and I are home alone this weekend and I wanted to do something fun and special, just my boys and I, so we headed to the waterfront! This is so cool… a bunch of really big beautiful ships docked right here. And they’re RACING. And the Bluenose was here (pic for hubby)! I thought the boys might like taking a tour of some of the ships, but the lines were super long and not really little-boys-that-like-to-pick-on-each-other-friendly. We took a little tour of the harbour on the Harbour Queen. I wish it had been on a tall ship and I’m not sure how impressed the boys were with the ride, but it was neat to see the tall ships and the city from the water. This was by far the coolest ship – from Spain and totally a pirate ship. It even had cannons sticking out the sides. The boat ride may have been over-shadowed by anticipation for this – the bouncy castles. Several to choose from, all of them a blast, but this may have been the favorite – the Toxic Drop. So pretty. We spent the rest of our time eating pizza, at the playground, having ice cream (that we were able to completely eat in a very long line while waiting to pay), riding the wave (if you’ve been, you know what I mean). We tried to take in the concert with Natalie McMaster and the symphony, but after five minutes (and as I’m standing there wow’ed by the energy) Oliver said, “Mommy, this music doesn’t even have words” and they both lost patience (and this after almost being crushed by the crowd to get in there). This was what we were waiting for. The fireworks were shorter than I expected, but still cool. Location, location, location. And who doesn’t love being downtown at night? The people, the live music, the lights… and I got to do it all with two of my favorite people. I’m a fortunate gal. Categories: Emerson, Family Fun, Oliver, Summer! | Permalink. Eleanor, Emery, and I spent last week in NB for Ali’s homecoming! After years away, her and her family have moved back to NB. We got to meet Sofiyah for the first time, get re-acquainted with Aaliyah, and spend some quality time as a family. Home. I have so few pictures for what I feel was such a busy week, but here are a few highlights. The kids really wanted a campfire. It was a super hot week, but we picked an evening to roast marshmallows and make s’mores anyway! Sofiyah knows how to pose… clearly her mama owns a camera! We had several wheeler rides up over the hill, on the trails I ran over many, many, many times as a kid. We collected so many wild flowers to place around nana’s house! Saturday morning we all went to the fields to pick raspberries and strawberries. It was a beautiful summer morning! I love showing the kids where their food comes from and the scenery, my old stomping grounds of holmesville, is a special place to do it. On Saturday afternoon we had a little walk at the beechwood dam. They still keep the big clock looking nice (although the time could use a little fixing). 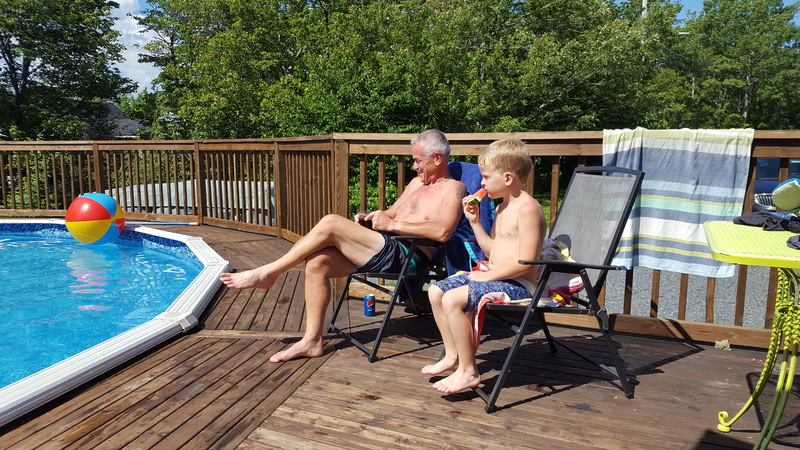 So many moments not captured – swimming at the bath pool, splash pad, a family BBQ (complete with washer toss tournament), an evening at Fresh with Ali, Phase 10 – but great memories made just the same! Categories: Eleanor, Emerson, Family Fun, Summer! | Permalink. 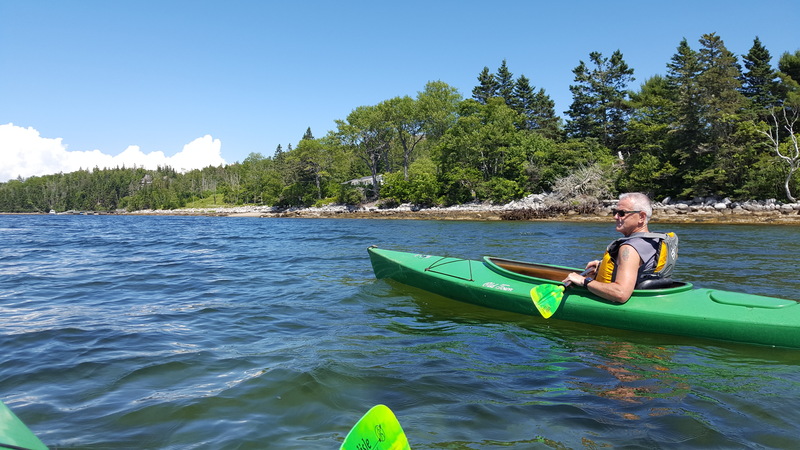 Today papa and I headed out in the kayaks in St. Margaret’s Bay. 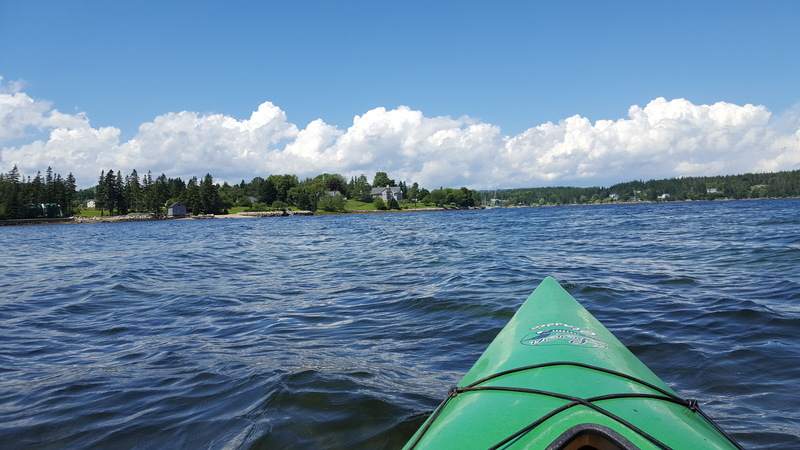 It was one of the best summer days we have had so far, just a beautiful day to be on the water! Gotta love the company too. Time with my dad is always well spent. We spent the rest of this beautiful day enjoying the pool, popsicles, and watermelon. 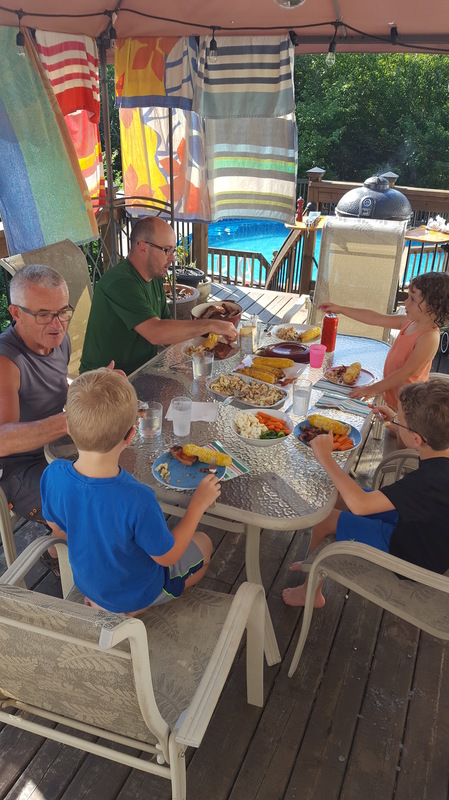 The only way to top off a summer day is with a bbq and ice cream! Unfortunately nana spent the entire weekend sick with the flu. 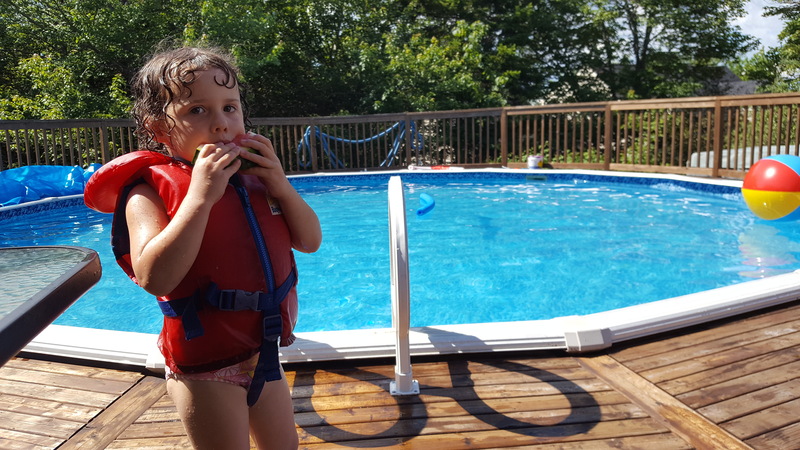 She hates to miss out on the fun (especially the pool) but felt awful the entire time. Rotten luck. We will have to party twice as hard next Time! We spent Canada day with Yogi! Our first camping trip of the summer was a great one spent with great friends and new friends. Camping – it’s a ton of work but it’s totally worth it to get away for a few days and watch the kids have fun. It’s great that the boys are at the age they can just take off on their bikes for a while, roam and have fun on their own. It was a wet weekend but the pouring rain was mostly not during the waking hours, so we were able to make the most of it. Thankfully Eleanor had her lovely pink umbrella! We played quite a bit of washer toss, kids and grown ups alike. Hubby and BJ even won 2nd place in the washer toss tournament, so obviously all that practice really paid off! Like I said, it was soggy! Thankfully we all had our rubber boots packed! They had a great pool that even the rain couldn’t keep us away from. The boys put water bottles in their bike tires to make their bikes sound louder. They saw one boy doing it and pretty soon all of the bikes going by had them. It was the fad of the weekend… like a biker gang! Early morning sillies while the rain died down. On Sunday morning we went to the Oaklawn zoo. It seems to be in the middle of nowhere so I wondered how good it could be, but it blew me away! We were there early so the animals were up and about and we almost had the place to ourselves. Lions, tigers, a cougar, monkeys (so many monkeys), zebras… it was amazing! Oliver manned the camera during the trip so there are a million animal pics, but here are a few. We called this porcupine Ash because it reminded us of Ash from the movie Sing! Oh my gosh, the goats. There were so many goats! I love goats so much, I think they are my spirit animal. They are really friendly because of course they think you’re going to feed them. The babies though… adorable! On the jumping pillow at Yogi. Yes, more washer toss! It was such a great weekend! The camper is cleaned up, laundry is done… we are ready for the next one!